The study is the first of its kind and strongly supports the theory that a floating ice shelf might have formed in the Arctic Ocean during some of the Earth’s Ice Ages. The research, led by Dr Ed Gasson, from the University of Sheffield’s Ice and Climate research group published today (17 April 2017) in Nature Communications, used a numerical ice sheet/shelf computer model to show that an ice shelf in the Arctic Basin could only have become a kilometre thick if it covered the entire basin. This model also provided an estimate of the ice shelf’s size – up to 1.7 times the size of Greenland’s current ice sheet. The study also found that the Arctic ice shelf might have increased the volume of ice sheets on land surrounding the Arctic Ocean. Its presence may also explain discrepancies in sea level reconstructions. 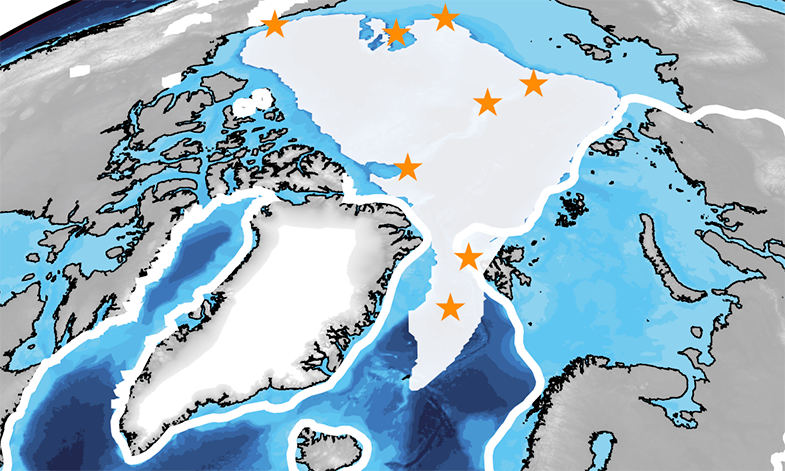 The results are consistent with a recent discovery of ice scours – a narrow ditch on a seabed caused by the movement of pack ice – on the Lomonosov Ridge, which runs across the middle of the Arctic Basin. This indicated that a floating ice shelf might have formed in the Arctic Ocean during some of the Earth’s Ice Ages. The hypothesis of an Arctic ice shelf was first put forward in the 1970s, but there was limited evidence supporting it. When ice reaches the seafloor it causes erosion. Although ice scour marks have been found on the Arctic seafloor previously, it was argued whether the keels of icebergs or an ice shelf caused the scours. However, a recent research cruise to the Arctic discovered new traces that had the tell-tale signs of a former ice shelf. The ice shelf most likely formed during the penultimate glacial period around 140,000 years ago. There is no evidence yet that an ice shelf also formed during the Last Glacial Maximum around 20,000 years ago, when much of North America and northern Europe was covered by ice sheets. The study suggests that this could be due to differences in the Earth’s orbit or because the Eurasian ice sheet did not expand as fully towards the Arctic Basin. One challenge with detecting floating ice shelves if that they can leave no traces unless they ground on the seafloor, leaving open the possibility that a thinner ice shelf also formed during the Last Glacial Maximum.